AW Chain 6 is here. An event I am getting addicted to. It’s amazing to see how one subject leads to the other, leaving you enriched and entertained by the end of the process. Before me, Kelly spoke about some comedy flicks that featured muscular action heroes trying their best to manage little babies. Now, that instantly makes me smile. The proposition of tough men at their clumsiest worst when it comes to babysitting is intrinsically funny, isn’t it? So what is it that makes a good comedy film? If I had to nail it down, I would say it just takes an intelligently crafted story that taps in to the foibles of human nature and gives them a lighter spin. How do you measure a comedy film as good or trash? Again, the yardstick for me is a simple and time-tested one. If the film manages to make your stomach hurt with laughter even after you’ve seen it 58 times, it has to be good. 1. GOLMAAL (Topsy-turvy): Ram Prasad is a middle-class chartered accountant, desperately looking for a job to support himself and his sister. He is thrilled to learn about a vacancy at a firm owned and run an eccentric old man called Bhavani Shankar. However, there is a catch. The old man believes the youth of the country should focus only on their jobs, and not waste time on other interests like sports or entertainment. Ram Prasad, a soccer and hockey lover goes prepared for an interview with this quirky gentleman. He impresses Bhavani Shankar when the latter asks him a question on Pele, and he apparently fails to recognize the soccer maestro. He gets the job. Trouble starts when the boss spots Ram Prasad on the spectator stand at a soccer match he goes to attend. When called in for explanation, Ram Prasad fabricates an impeccable (and imaginary) tale of his younger brother, Lakshman Prasad, who he says is a wayward young man, wasting his youth on sports and music. He convinces his boss that it was Lakshman whom the old man had seen at the stadium. He further claims the younger brother doesn’t sport a moustache. What follows is a rollercoaster of uproarious situations, in which Ram Prasad has to switch between the roles of his own self and that of his sans-moustache fictional brother, forever at the risk of his boss stumbling upon the truth. 2. 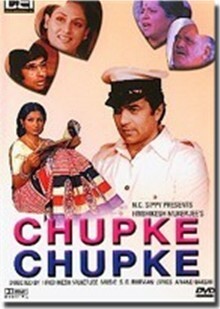 CHUPKE CHUPKE (Stealthily): A well-plotted story of how a couple decides to dupe their relatives for some harmless fun. A newly-married couple–a botany professor and his wife–plan to play a prank on the wife’s brother-in-law, a judge who is very particular about the use of pure Hindi. The professor, hitherto unseen by these relatives, takes up a driver’s job at the judge’s house, exhibiting his unadulterated Hindi-speaking tendencies. Things get suspicious for the older couple when the judge’s sister-in-law is seen to openly flirt with the new driver. The situation gets out of control when the duo actually elopes and another (planted) character emerges, claiming to be the botany professor. Imagine the older couple’s embarrassment, even as the man claiming to be the botany professor is actually a scholar of English literature and has a hard time teaching botany to a young girl he begins to fancy while still posing as the married professor. 3. JAANE BHI DO YAARON (Let it be, Friends): A remarkable film that was a blend of black comedy and slapstick. Two photographer friends set up shop in the busy Mumbai city. Their first assignment comes from a newspaper editor, and accidentally the two friends photograph a murder scene. They are dragged increasingly into the dark and deceitful world of corrupt administrators and businessmen. A brilliant satire enacted by some of the finest actors of the Hindi film industry, this flick was marked by witty dialogues, hilariously absurd sequences, and an unmistakable dig at urban ugliness (not just the physical part of it). 4. 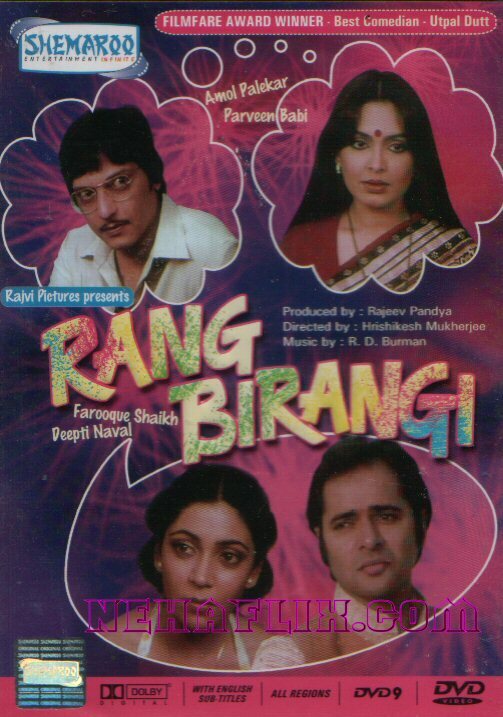 RANG BIRANGI (Colourful): A riotous comedy on a bachelor friend’s attempt at rekindling the spark in the marital life of another friend. His script turns the lives of the married friend, his secretary, her boyfriend, and a whole lot of other people in the film into a complicated labyrinth of circumstances. The plot hatched by the bachelor friend is the backbone of the film’s plot. Fantastic plotting and rib-tickling scenarios conspire together to produce an explosively funny film. 5. KATHA (Tale): Yet another social comedy, reflecting the dilemmas of urban life. Rajaram is an honest middle-class clerk living in a densely-populated locality of Mumbai. He secretly loves his neighbour, Sandhya, but can’t profess his feelings to her. Soon, he is joined by his smooth-talking-but-idle friend, Bashudev. The latter wastes no time in courting Sandhya, even while living in Rajaram’s flat at the nice guy’s expense. A classic hare-tortoise story, in which, thankfully, the tortoise wins the battle after almost losing it. Bashudev takes the cake, though, entertaining and disgusting the audience at the same time. All of those sparkling funny bubbles, filled with natural laughing gas are stories of ordinary people caught in the daily grind. They make for healthy, wholesome family entertainment. All of them deserve separate entries. Maybe some other time. For now, let me navigate you to the Indian-movie-loving Simran at Writing From Within. I spend so much time telling you about the movies and shows I watch and yet never did I know about some of your faves (blush) This certainly looks like a fun bunch! And you do so well, feel like mini reviews. Kudos! I love it! Now, I’ll have to get some of this films. Of course it is a perfect segway into my blog Everything Indian, but since I’m using the Writing from Within Blog, I’ll just have to put it there. Can’t miss this opportunity. Great post Bhaswati, thanks! You’re making me regret having missed the chance to see a live Bollywood musical at the Fox Theater. I need to see one of those movies; they sound like fun. Good thought train for the blogchain. I don’t think I will find any of your favorites at our video rental store! Some great movies. Well, if possible next time, please write about Bengali movies. I am a big fan Uttam Kumar and Suchitra Sen. They are really the best. 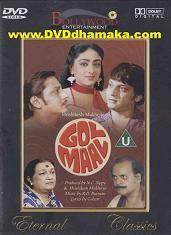 Bhaswati, Golmaal has got to be one of my favorite Hindi films of all time! I remember how we would watch it over and over and it would never fail to make us laugh. I am tempted to rent it for my kids just to see if they enjoy the humour as much as I did! :)I also remember Chupke,Chupke and Jaane bhi do Yaaron. I haven’t seen Katha, but your write up sure makes me want to. Cesar, yes, for a change, it’s me sharing movie stuff this time. LOL. Glad you liked them. Kelly, watching comedies are good for the heart, soul, and oh, lungs! Keep watching those. ;)Simran, I thought it was so perfect that my post on Hindi films should be followed by yours on the chain. Do watch these if you can; you will love them. :)BK, you right, as usual. ;)Matt, these films are loaded with fun. Do see them if you can (I believe they would be available with English subtitles in the U.S.)Susan, what happy (and funny) memories you brought back. Which Indian wouldn’t know Tuntun? She was a riot, all right. Did you know she was also a good singer? Not many know about her singing talents. Harbormaster, it’s a pity you won’t get these in Alaska. They sure make for great entertainment. Razib, thanks. I will definitely keep your request in mind. 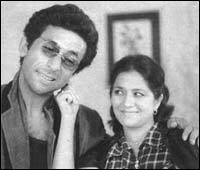 Uttam-Suchitra is my favourite couple too. Which Bengali doesn’t adore them? :)Lotus, I can guarantee your kids will enjoy Golmaal as much as you did. It can’t fail to make people laugh, whatever be the time and age. Do see Katha if you can. It’s an excellently made film on the chawl life of Mumbai by the talented Sai Paranjpe. I noticed that your choice is on the movies made in the 70s and 80s…another memorable one from those years was Gulzar’s Angoor, an adaptation of Shakespeare’s “Comedy of Errors”.- bhupinder(since I upgraded to beta blogger, I can post only as anonymous). I love comedy. So much of our modern comedy today is not funny and even inappropriate. True comedy, as you’ve so wonderfully written about, can make your sides split not because they go so far out on the limb they lose you, but because they are about everyday ordinary people perhaps trying to extracate themselves from amusing situations. This is excellent Bhaswati! Makes me yearn for the comedy of old. Bhupinder, Angoor was in my shortlist when I wrote this post. However, it didn’t make it to the five because I remain partial to the Bengali version of Comedy of Errors called Bhrantibilash (oh yes, an Uttam Kumar starrer). Shadowrite, you said it so well. The comedies that are made these days in the Hindi film industry are not only not funny, they make you tear your hair with annoyance most of the time. No solid plot; cheap, crass humour; and over the top acting. Arghh! I love your list! I adore Bollywood comedies. A friend from Madras addicted me to them when I was in my twenties. I never remember what I’ve seen because until recently they weren’t subtitled so I tend to remember the friend’s voice who translated for me. I bought a bunch a few weeks ago and they are all subtitled. I’ve out your favurites on my wishlist :). Hey Oni, great to see you here! Hope school is treating you well, friend. :)Gillian, always a joy to find a lover of Hindi films! Do watch these films if you can; you won’t regret the experience.Laurie, I hope you can get at least a couple from that list. Amitabh as an younger actor was dashing, with a rather commanding screen presence. It’s amazing how he continues to dominate the screen even past the age of sixty. I think you will enjoy his older films. Do let me know! Great post! The only movie I can think of that consistently makes me laugh out loud is “Abbott and Costello Meet Frankenstein.” Truly a side-splitting classic comedy. That worked out perectly didn’t it Bhaswati? Yes, I will try to get these films too. Thanks.Shah Rukh Khan’s favorite American comedy film is – It’s a Mad, Mad, Mad, Mad World. Watch it if you haven’t. What a fantastic post. I’m yet to experience what Bollywood has to offer. I think the closest I’ve gotten is Bend It Like Beckham – only because of the cultural hints in it. Ugh, I sound so ignorant! I’ve seen Bride and Prejudice and that was pretty funny – in a corny sort of way.Thanks for the write ups!